Game description: Legends of Wrestling II takes you through the wrestling hall of fame with the top grapplers that are battling for squared-circle supremacy. Play as your favorite wrestler--including Hulk Hogan, Andre "The Giant," and Bret "Hitman" Hart--each with signature entrances, taunts, and moves. A new storyline and career mode let you battle for the respect of promoters and fans while fighting for the heavyweight championship crown. The game also features tag-team tournaments, a $15,000 Body Slam Challenge, and a variety of match types. 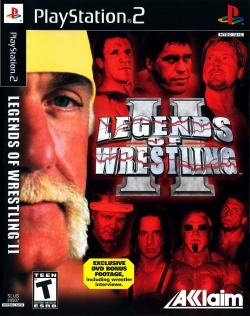 Legends of Wrestling II builds upon the retail success of its predecessor and will feature all new match types and more than 65 superstars, including Hulk Hogan, Andre The Giant, Rowdy Roddy Piper, Bruno Sammartino, Bret "Hitman" Hart, Sid Vicious, "Big Poppa Pump" Scott Steiner and Jerry "The King" Lawler. Hangs on character select screen. Tried numerous fixes and settings and can't get past it.